This Rotterdam, the fourth of five Holland America ships to carry that name, was built by Harland & Wolff, Belfast. She was launched in March 1908, on the third attempt; the first was thwarted by gales and she stuck on the ways on the second try. She was the largest Dutch ship up to that time, a distinction she would hold until the arrival of Statendam III. 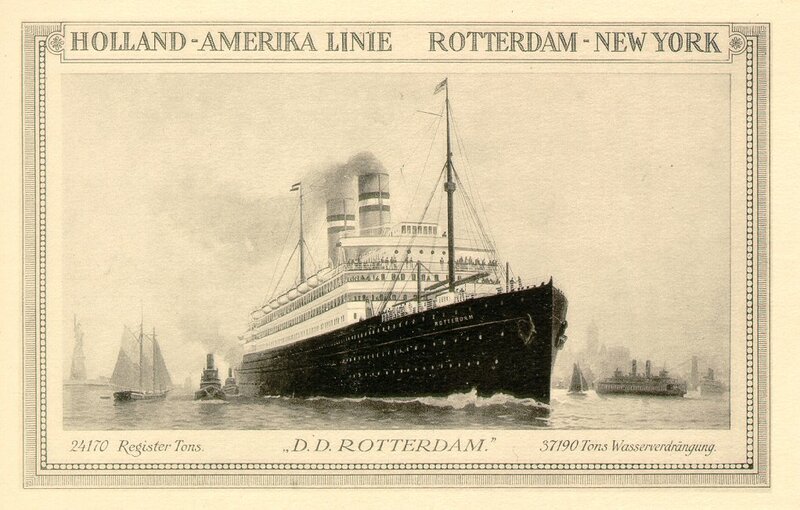 The first transatlantic liner with a glassed-in promenade deck (which, oddly enough, does not appear on the card on this page), Rotterdam has been described as "the first truly de luxe H.A.L. liner" (Kohler.) She made her maiden voyage from her namesake port to New York on 13 June 1908, and during the early years of her career was involved in several Holland America firsts, including the line's first mail-carrying trip after obtaining the Dutch mail contract in 1909 and HAL's first eastbound call at Plymouth in 1910. In August 1913, she set a company record with a total of 2,937 passengers and a year later she carried a record 1,386 first-class passengers, mostly Americans fleeing Europe at the outbreak of World War I.
Rotterdam remained on commercial service until March 1916, and was then laid up at Rotterdam until the war was over. She returned to service in February 1919, on her prewar route. Converted to oil in 1923 and modernized in 1925, Rotterdam spent the balance of her career cruising, in addition to her transatlantic duties. She was, in fact, on a cruise in September 1939, when World War II began. After competing that trip she made two more neutral-flag Atlantic crossings with returning Americans, and was laid up when she returned to Rotterdam on 28 December. A month later she was sold for scrap. Sources: Haws' Merchant Fleets; Kohler's The Holland America Line; Bonsor's North Atlantic Seaway; Kludas' Great Passenger Ships of the World.